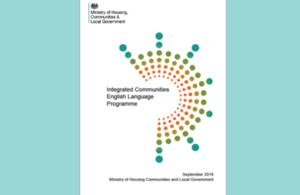 The government’s integrated communities English language programme, set to begin next April, aims to tackle one of the key causes of poor integration, a lack of English language skills. Councils, charities and other providers will have the opportunity to bid for funding to run new programmes which offer creative ways of teaching English to local residents. "Being able to speak English can transform lives and help people play a full, active role in British life. "No one deserves to miss out on the opportunity to build self-confidence, interact with their neighbours, make friends and gain employment. This fund of up to £6 million will help us build even stronger communities." Individuals with low levels of English will be able to reach their full potential through a wide range of local services including those provided by charities and other organisations. The new programme follows on from the government funded community-based English language programme, which has already supported over 73,000 adults over 5 years, specifically focusing on women who are economically inactive. Shagufta has adult children who interpret for her, yet she struggled to bond with her grandchildren. She enrolled for mainstream English for Speakers of Other Languages classes, but found it difficult so stopped attending after 2 or 3 sessions. Since signing up to community-based tuition, she has not missed a single class as she finds the learning activities useful for everyday life. She is now able to teach her 4-year-old granddaughter nursery songs. Razna has been living in Birmingham for 17 years with her husband and 2 children. She avoided travelling more than 300 metres away from her home or visiting the city centre as she feared getting the bus or train. Community-based training provided by local volunteers helped build her confidence to purchase a ticket and travel to the centre. She now uses the train to visit the doctor and take her children to museums. Fatema couldn’t speak English when she arrived in the UK 3 years ago, and mainly stayed at home as she had not been to school in Afghanistan. The informal Talk English course helped her to settle into a learning environment and develop basic study skills. After building her confidence, Fatema has now moved on to a more advance ESOL course with Lancashire Adult Learning and took her first exam in June. With almost 3,500 responses, the government’s Integrated Communities Strategy green paper set out proposals to support people to speak English, including a new community-based English language programme from April 2019. The government will issue its response to the consultation later this year. At the last Census, around 770,000 people living in England said they spoke little or no English. Higher proportions of women than men reported they cannot speak English well or at all across most ethnic groups, and overall Bangladeshi and Pakistani ethnic groups have the highest proportions of people aged 16+ who said they cannot speak English well or at all, compared to other ethnic groups. With just 35% in employment and 59% economically inactive, Pakistani and Bangladeshi women of working age were the least likely to be employed and the most likely to be economically inactive.